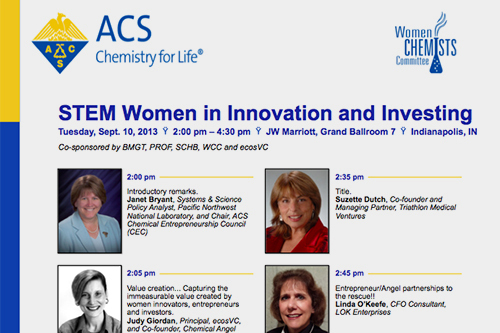 The CIEC is a coalition of American Chemical Society (ACS) organizations and allied partners whose aim is to help all chemists gain the skills to translate research into innovations that can become commercial products, build strong careers and strong companies that create jobs, and a strong and positive reputation for chemistry. The CIEC supports chemists of in all fields – academia, industry, start-ups and government. ecosVC is pleased to host the CIEC website as an opportunity to enhance training opportunities for chemists in innovation and technology translation, and connect with funding opportunities (e.g. Chemical Angel Network). CIEC resources are designed to promote the exchange of information and enhance networking between chemists and ACS meetings and beyond. CIEC Roadmaps provide ACS members with a guide to programming and events related to innovation and entrepreneurship at national and regional ACS meetings. Out of the thousands of papers and events we have highlighted the topics of greatest interest - we've done the legwork to make your meeting easier! ACS hosts 2 national meetings a year and our CIEC roadmaps are usually available 2 months prior to a meeting. A guide to the American Chemical Society Chemical Entrepreneurship Webinar Series is available on our resources page. Lens of the Market® Stage 1 Research to Innovation at the 2017 ACS Northwest Regional Meeting (NORM 2017) in Corvallis. BMGT provides resources for chemists to combine technical abilities and knowledge with business & management competencies and personal interests to forge successful careers. PROF helps members effectively manage their careers in the chemical and allied fields. SCHB aids in the formation, development, and growth of small chemical businesses by helping chemists working in small enterprises, including self-employed, with the legal, social, educational, legislative, regulatory, and economic aspects of their unique professional status. SCHB serves as a clearinghouse of information, a forum for discussion, and a liaison between small businesses and students. CEPA identifies and monitors the needs of the chemical workforce and develops, coordinates, and oversees the implementation of programs and activities to enhance the economic and professional status of chemical professionals. The ACS MAC is involved with recruiting and retaining ACS members by ensuring that ACS membership is a valuable resource in their professional lives. The WCC serves the membership of the American Chemical Society. They are leaders in attracting, developing, promoting, and advocating for women in the chemical sciences in order to positively impact society and the profession. The YCC advocates for and provides resources to early-career chemists and professionals in the chemical sciences and related fields. The YCC addresses specific issues facing younger chemists within the ACS and serves as a voice to the Society on behalf of younger chemists. The CAN provides a mechanism for accredited angel investors to source and vet quality early-stage investment opportunities, assist entrepreneurs and early-stage growth companies and be a quality source for information, educational resources and advisors.